How can you get freelance jobs from LinkedIn ProFinder? One of the best things about ProFinder is how easy it is to get started. LinkedIn’s freelance marketplace is an extension of the business networking site, and they’ve made it relatively simple to make connections. There are five basic steps, and here’s a quick breakdown to get you up and connecting in no time. Because LinkedIn ProFinder is an extension of LinkedIn, your first step is to make sure you have a profile on that social network. The application process relies on your profile to provide the relevant information about your qualifications, so before you get started you’ll want to make sure your LinkedIn profile is optimized for the type of work you’re seeking. Once that requirement is met, follow these steps to begin making connections and securing clients. Log into LinkedIn. If you’re on your desktop, in the top right corner you’ll see a square made up of nine smaller squares and the word “Work.” Clicking on that brings up more LinkedIn products, including ProFinder. Or click https://www.linkedin.com/profinder from either mobile or desktop. Once you’re in Profinder, click on your name on the top right, and then click on “Are you a Pro?” from the drop-down menu. This will bring you to a page with an Apply now button. You’ll be presented with a series of questions. The first one asks what kind of service you provide. These are not in alphabetical order, and may be sorted by the most popular services at the top. You can only select one of these macro categories of services. After you select a category and click on Continue, you’ll be presented with several areas of expertise within that service. You can select as many of these specialty categories as are appropriate for your skill set. For example, a copywriter would select Writing and Editing as the service provided, and then select Copywriting as an area of expertise. The freelancer could also select Ghostwriting if that kind of work is desired. The final piece of the application is to add your phone number so that a ProFinder concierge can contact you with any questions. In the video above, I give you a peek at the acceptance letter you will receive after you have been approved by the Profinder team. I also take you on a quick tour of a real ProFinder Profile and its Client Request folder. 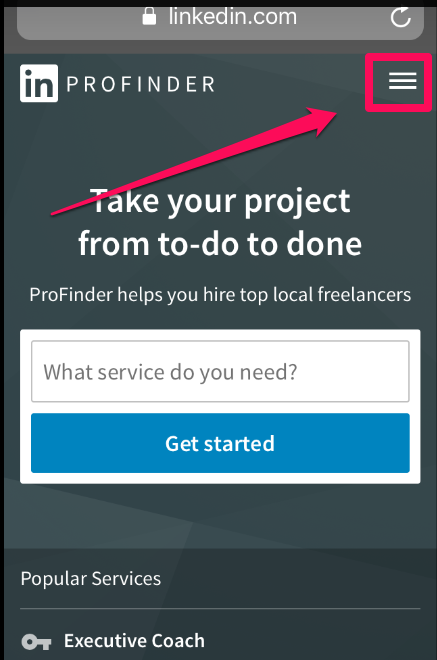 One you’ve been approved, LinkedIn ProFinder will send project leads from a 50 to 100 mile radius around your zip code directly to your in-box. These are based on the skills indicated in your application and the strength of your profile. 5) If There Is Mutual Interest, Discuss and Finalize Details. At this point you and the potential client will discuss the project in more detail and decide if you’re truly a good fit for each other. Not only will you set the parameters of the project and the work involved, you’ll also finalize payment. Unlike some other freelance marketplace platforms, all of this happens outside of LinkedIn ProFinder, so you’ll want to make sure that your final agreement is specific in both the details of what’s required as well as the financial arrangements. These five steps are the basics of how LinkedIn ProFinder works for freelancers. As you can see, its primary function is to make connections between you and small businesses and other types of clients looking for outsourced help. Next step for Freelancers: Check my video playlist on How to Create a Good ProFinder Profile. Visit my YouTube channel and subscribe so you can find out first when I’ve uploaded more guides to LinkedIn ProFinder.